Mr. & Mrs. Aaron Fox on the birth of a daughter. Mazel tov to the grandparents, Rabbi & Mrs. Yakov Fox. Mr. & Mrs. Asher Kohn on the birth of a son. Shalom zachor at Shaarei Tzedek after 7:00pm. Rabbi & Mrs. David Segal on the birth of a grandson born to Moshe & Rivy Segal in Texas. Mazel tov to the great-grandmother, Mrs. Eva Weiss . The 8:20 Kiddush is sponsored by Mr. & Mrs. Eliezer Gross. Rabbi & Mrs. Sam Seleski in honor of this Shabbos Shel Eretz Yisrael/Shabbos Shel Tu B’Shvat. Anonymous, Mr. & Mrs. Benjy Kandelman, Mr. & Dr. Adam Kirshner, Mr. & Mrs. Gavriel Prero, Rabbi & Mrs. Sam Seleski, Rabbi & Mrs. Levy Sheinfeld, Mr. & Mrs. Lance Taxer, Dr. & Mrs. Yakov Weil & Mr. & Mrs. Heshy Wengrow. Yeshurun was saddened to hear of the passing of Mrs. Fern Weller, a”h, wife of Dr. Herschel Weller, mother of Jessica and Jeremy, and sister of Mrs. Naomi Klein and Rebbetzin Michla Schanowitz. The Levaya was in Eretz Yisroel. The Stewart Sheinfeld Father and Son Learning Program continues this week at 6:30pm. This week is not yet sponsored. Pirchei is on Friday nights from 7:45-8:45pm. Delicious cholent made by Joey Zimmerman will be served. Thank you to Bruce Nedwin for his appreciated weekly assistance. 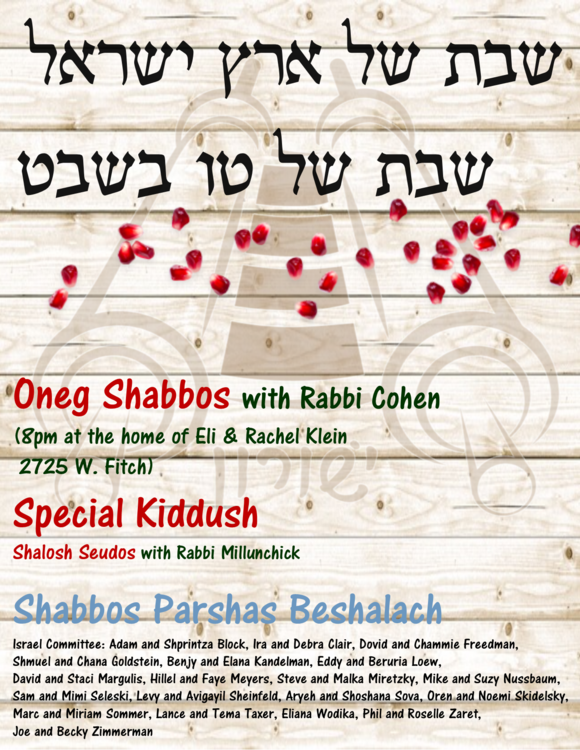 This Shabbos, Parshas Beshalach, there will be a special Oneg with Rabbi Cohen on the topic, “Rules of Majority: What Happens When Most of the World’s Jewry is Residing in Eretz Yisrael and How This Connects to Tu B’Shvat” at 8:00pm(at the home of Eli & Rachel Klein 2725 W. Fitch ) Kiddush and Shalosh Seudos in honor of Tu B’Shvat. 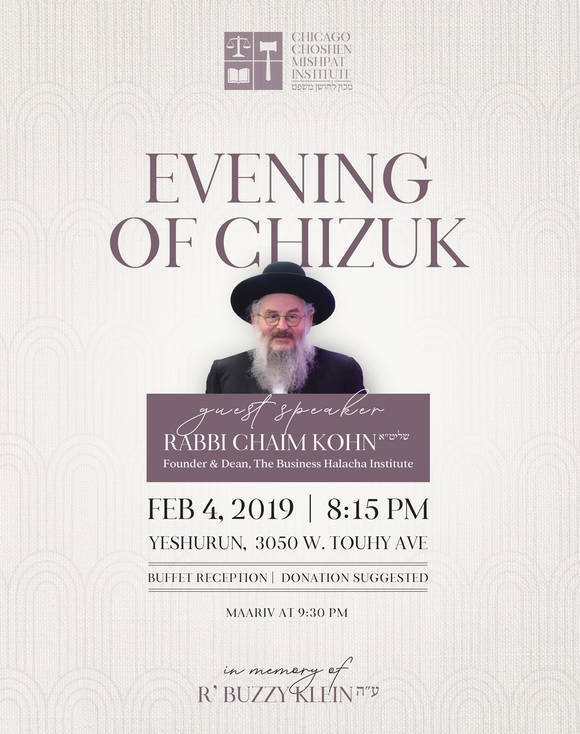 Monday, Feb 4 at 8:15pm, please join the Choshen Mishpat Kollel for our annual Evening of Chizuk in memory of R’ Buzzy Klein with guest speaker Harav Chaim Kohn, Founder and Dean of the Business Halacha Institute. Topic: “The Halachic Response to a Changing Global Economy”. Looking forward to broadening our halachic perspective together. The 3rd annual Cholent Cook Off will be Shabbos Parshas Terumah, Feb 9th. To join the competition, please contact Ellie Fliegelman at Cholent@adaseshurun.com. 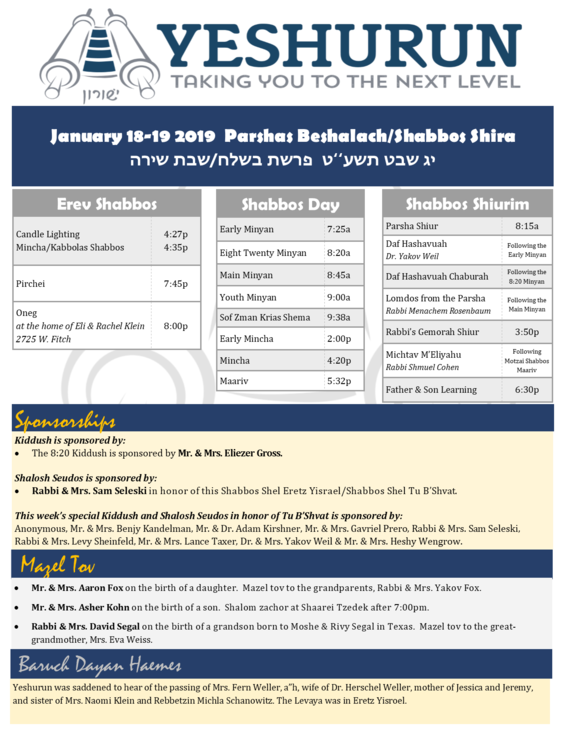 There will be a 9:00am weekday Shacharis added to our schedule beginning now through Friday, January 25. 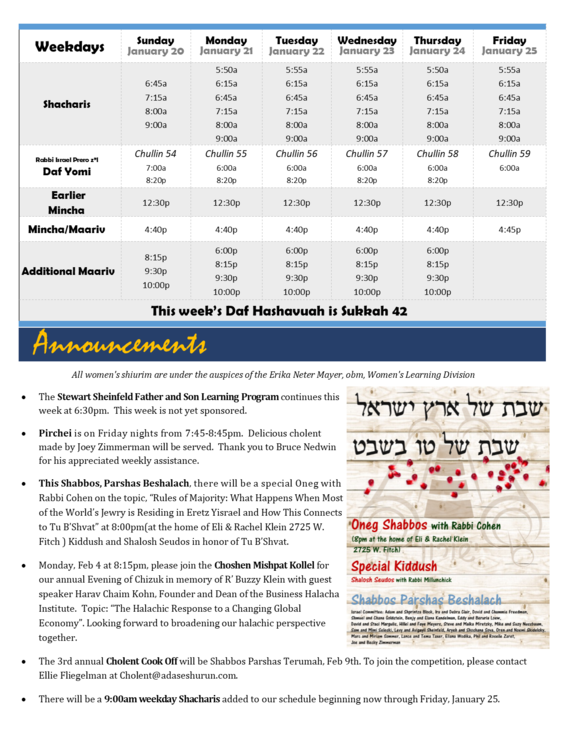 Rabbi Cohen will not be giving any shiurim this week.